Dedicated General Counsel for businesses just like yours. Learn more about our flexible pricing and how we can grow with you. A General Counsel can help you get up and running, guide you through challenges, and maximize opportunities. You save money and realize your goals sooner and with fewer headaches. 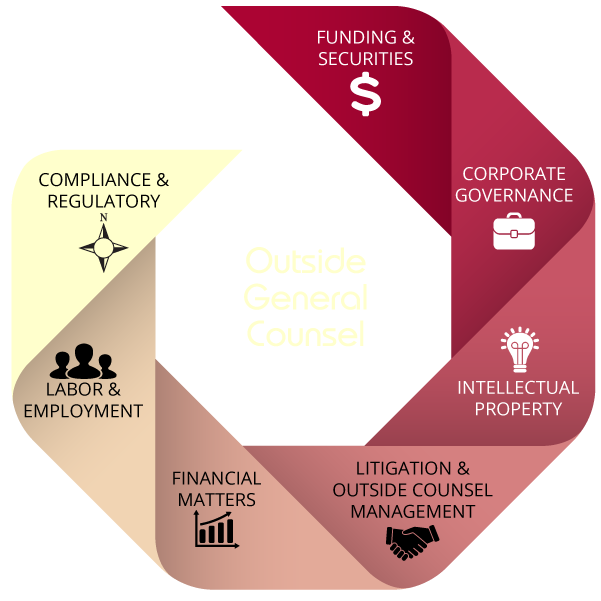 Moreover, as part of senior leadership, the General Counsel is a valuable resource for planning proactive business strategies that prevent a reactive and expensive game of legal whack-a-mole. Our affordable monthly fee arrangements are a fixed cost to your business, with no clock ticking every time you have a question. Scaled discounts for retainer-based engagements means your discount increases with the number of hours required. We cultivate long-term relationships, so we schedule regular look-backs with our clients to ensure that the arrangement is equitable and fair for everyone. Whether you’re just starting up or you need us to supplement your current legal team—including existing outside counsel—we will embed seamlessly into your organization for an organic arrangement.